Johnny Neill was pianist, arranger and musical director for Lawrence Welk from 1937 to 1940 where he composed "Bubbles In The Wine", which became the Lawrence Welk theme song for many years to come. Neill was born on June 14, 1914 as John Kenneth Neill in Mound City, Missouri. When his family moved to Scotts Bluff, Nebraska, Neill began taking instrument lessons and played violin in the high school orchestra. Neill was playing piano with a dance band in the depths of the Great Depression when Lawrence Welk approached him at an Omaha nightclub and offered him a job. Welk asked Neill to write some musical arrangements for his orchestra. When Neill completed the works for Welk, he was offered $5,000, but he told the band leader he'd be money ahead if he hired him as an arranger which Welk did. On one afternoon following a rehearsal for a show in Fairmont, Nebraska, Welk asked Neill to write a theme song for the band. Neill went to a back booth in a cafe and wrote "Bubbles in the Wine," which became Lawrence Welk's theme song. The music was later adapted with words and credited to the famous composer Frank Loesser (i.e. "Baby, It's Cold Outside"), Bob Calame and Lawrence Welk. 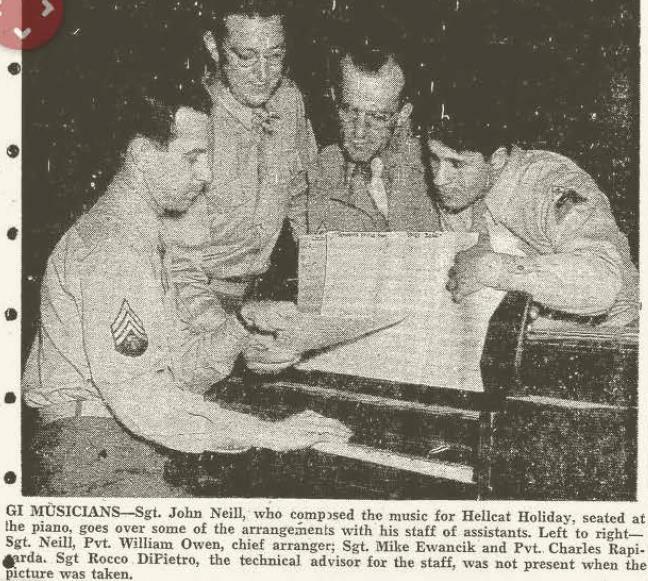 Neill left the Lawrence Welk Orchestra in 1940 and to serve as an Army sergeant in the 12th Armored Division. During his service in Germany, Neill won the Bronze Star for retrieving pilfered film supplies from behind enemy lines. After the war, Neill set up his own orchestra. From the late 1940s to the mid-1960s, Johnny Neill's orchestra, and the trios and quartets that replaced it when big- band music went out of style, provided music at the popular Top of the Park Ballroom at Denver's Park Lane Hotel. Photographs of Neill's orchestra hang in the Park Lane condominiums that replaced the hotel, which was demolished in 1966. The orchestra also performed in Colorado at the Brown Palace, the Broadmoor Hotel in Colorado Springs, the Stanley Hotel in Estes Park, the Rainbow Ballroom, the Trocadero Ballroom, the Denver Country Club, Tivoli Gardens, the Lagoon Nightclub and Sky Chef, a once-trendy restaurant at the old Stapleton Airport. Neill married Lois Price in Scotts Bluff, Nebraska who preceded him in death. He later married Lois Mills, and the couple gave organ concerts in Florida, Denver and Wyoming, as well as for the local bank and retirement home in Denton, Texas. He died Jan. 8, 2004 in Denton, Texas, at 89.